At about 80 seconds, this will surely be the shortest single I write about here. It's also - top 20 hit or not - the world's hardest single to find. Until Dale Winton played it on Pick of the Pops one Saturday a couple of years ago, I had never heard the Decca single version before. 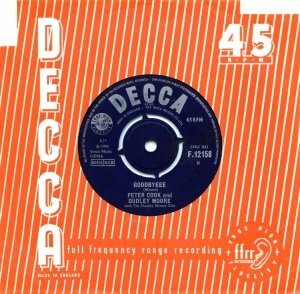 Its the closing song from each edition of Peter Cook & Dudley Moore's hilarious 1960s sketch show Not Only But Also, of which - with the characteristic foresight of the BBC archives - almost nothing survives. Dudley sat at the piano, Peter standing. For what is a merely functional tune to tail a TV show and allow the performers an opportunity to clown, the song has a real emotional kick to it, I think - like 'Give Me Sunshine' was to Morecambe & Wise. Goodbye, farewell, the note of leaving and loss. It's made more palatabley silly for the 1960s TV audience by being a twenties pastiche, a musical period also being mined at the same time for nostalgia and fun by The New Vaudeville Band and The Bonzo Dog Band. I find this to be very funny and rather affecting. I wonder how somebody who had no idea who Peter Cook & Dudley Moore were would respond to it? Utterly brilliant and quite mad!